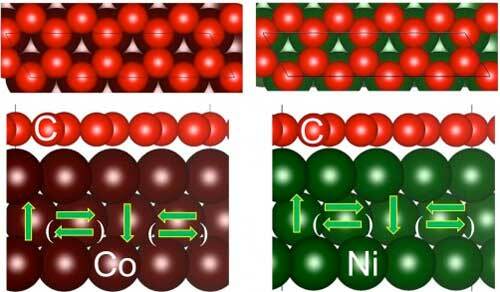 (Nanowerk News) Researchers working at the Department of Energy's Lawrence Berkeley National Laboratory (Berkeley Lab) coupled graphene, a monolayer form of carbon, with thin layers of magnetic materials like cobalt and nickel to produce exotic behavior in electrons that could be useful for next-generation computing applications. The work was performed in collaboration with French scientists including Nobel Laureate Albert Fert, an emeritus professor at Paris-Sud University and scientific director for a research laboratory in France. The team performed key measurements at Berkeley Lab's Molecular Foundry, a DOE Office of Science User Facility focused on nanoscience research. Fert shared the Nobel Prize in Physics in 2007 for his work in understanding a magnetic effect in multilayer materials that led to new technology for reading data in hard drives, for example, and gave rise to a new field studying how to exploit and control a fundamental property known as "spin" in electrons to drive a new type of low-energy, high-speed computer memory and logic technology known as spintronics. In this latest work, published in the journal Nature Materials ("Significant Dzyaloshinskii–Moriya interaction at graphene–ferromagnet interfaces due to the Rashba effect"), the research team showed how that spin property – analogous to a compass needle that can be tuned to face either north or south – is affected by the interaction of graphene with the magnetic layers. The researchers found that the material's electronic and magnetic properties create tiny swirling patterns where the layers meet, and this effect gives scientists hope for controlling the direction of these swirls and tapping this effect for a form of spintronics applications known as "spin-orbitronics" in ultrathin materials. The ultimate goal is to quickly and efficiently store and manipulate data at very small scales, and without the heat buildup that is a common hiccup for miniaturizing computing devices. "You could think about replacing computer hard disks with all solid state devices – no moving parts – using electrical signals alone," said Andreas Schmid, a staff scientist at the Molecular Foundry who participated in the research. "Part of the goal is to get lower power-consumption and non-volatile data storage." In more conventional layered materials, electrons traveling through the materials can act like an "electron wind" that changes magnetic structures like a pile of leaves blown by a strong wind, Schmid said. “Calculations by other team members show that if you take different magnetic materials and graphene and build a multilayer stack of many repeating structures, then this phenomenon and effect could possibly be very powerfully amplified," Schmid said. To measure the layered material, scientists applied spin-polarized low-energy electron microscopy (SPLEEM) using an instrument at the Molecular Foundry's National Center for Electron Microscopy. It is one of just a handful of specialized devices around the world that allow scientists to combine different images to essentially map the orientations of a sample’s 3-D magnetization profile (or vector), revealing a its "spin textures." "It has only recently become a hot topic," Chen said. "This effect in thin films had been ignored for a long time. This type of multilayer stacking is really stable and robust."